Washington, D.C. – Congressman Henry Cuellar today joined a bipartisan majority of the U.S. House of Representatives to pass the Mortgage Reform and Anti-Predatory Lending Act. The bill, which cracks down on predatory lending practices and ensures that the mortgage industry follows basic principles of sound lending, responsibility, and consumer protection, passed the U.S. House on a 300-114 vote. Included in the bill were amendments authored by Congressman Cuellar to study the real-world impact of a major new lending accountability measure and to provide housing counseling in Texas colonias. A key provision the bill would require mortgage lenders to retain a 5% stake in the loans that they originate. The measure is intended to address a critical vulnerability in the mortgage market that contributed to the economic collapse. Congressman Cuellar amended the bill to require the Government Accountability Office to assess whether the 5% requirement is the appropriate stake to reduce systemic risks, to monitor any shifts in practice by securitizers attempting to evade the new rule, and to recommend to Congress whether additional accountability measures are needed. Congressman Cuellar’s second amendment would clarify the mission of the new Office of Housing Counseling in the Department of Housing and Urban Development. 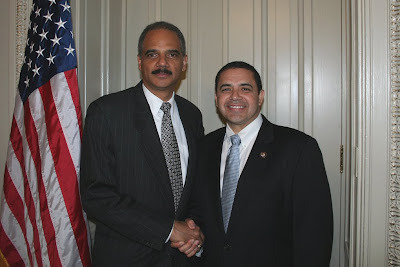 The original legislation instructed the office to focus on “areas that lack sufficient services”; Congressman Cuellar’s language ensures that colonias are included among these high-priority areas. “By recognizing the unique economic challenges facing colonias, my amendment ensures that residents have access to the guidance and support that all borrowers need to ensure that they get the best deal possible,” Congressman Cuellar said. ·Requires lenders to ensure a borrower's ability to repay, based on income, credit history, indebtedness and other factors. ·Prohibits unfair lending practices, including the bonuses known as "yield spread premiums" that lenders pay to brokers to inflate the cost of loans. ·Imposes penalties for irresponsible lending by making predatory lenders accountable to consumers for rescission of the loan and the consumer’s costs for rescission. ·Expands protections for high-cost mortgages by lowering the interest rate and the points and fee triggers that define high cost loans. ·Requires additional disclosures for consumers regarding mortgage loans, including the maximum that a consumer could pay on a variable rate mortgage, the amount of settlement charges, the charges included in the mortgage, the amount the consumer must pay at closing, and the fees paid to a mortgage originator. ·Protects tenants who rent homes that go into foreclosure by providing tenants with 90 days to relocate if they are using a unit as a primary residence. We have just added your latest post "Herald Cast: CUELLAR AMENDMENTS HELP TO CRACK DOWN ON PREDATORY MORTGAGE LENDING" to our Directory of Foreclosure. You can check the inclusion of the post here . We are delighted to invite you to submit all your future posts to the directory and get a huge base of visitors to your website.